The National Park service signs that are posted in front of the large sequoia trees had these really strange random facts, which I thought I would share (and some pictures, too). The General Grant giant sequoia tree in Kings Canyon National Park. Fact: If the trunk of the General Grant tree was a gas tank on a car that got 25 mpg, you could drive around the earth 350 times without refueling! Fact: If the trunk of the General Grant tree could be filled with sports equipment, it could hold 159,000 basketballs, or more than 37 million ping-pong balls! Fact: The General Grant tree is so wide it would take about twenty people holding hands to make a complete circle around its base! 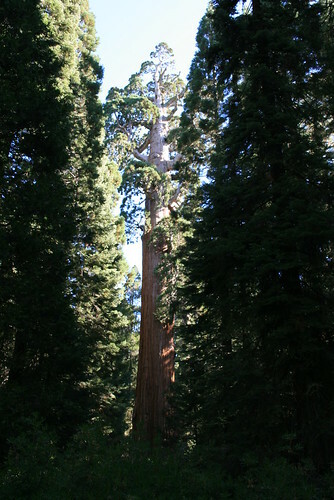 Fact: The General Grant tree is the world's widest known sequoia and the third largest sequoia in the world by volume! The General Sherman tree in Sequoia National Park. Fact: If the trunk of the General Sherman tree could be filled with water, it would provide enough water for 9,844 baths. Thats one bath every day for 27 years! Fact: Looking up at the General Sherman tree for a 6 foot tall human is about the equivalent of a mouse looking up at a 6 foot tall human! 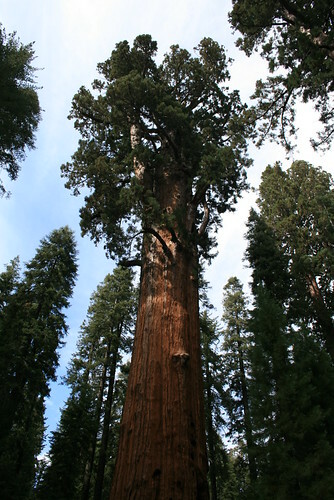 Fact: The General Sherman tree is the world's largest tree by volume and the world's heaviest tree!